This is why I love having a blog. Last week, we had our wedding issue on Cincy Chic. 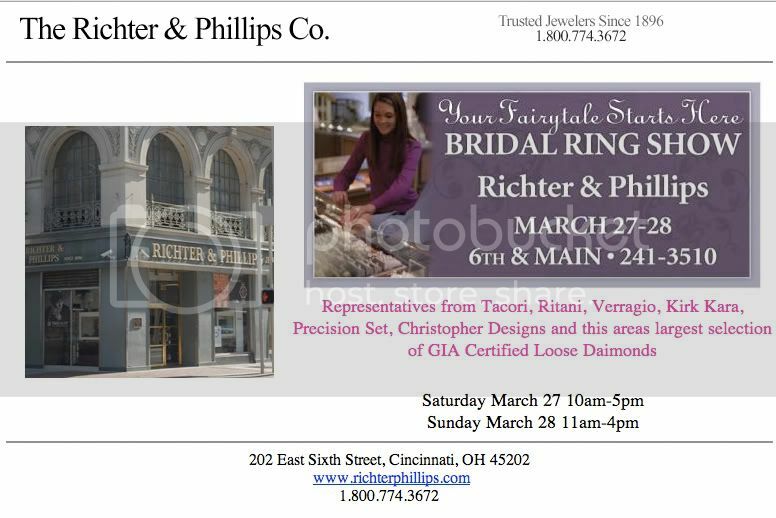 And literally three days after we publish it, I get an email about a big bridal jewelry show at Richter & Phillips! Normally, I’d just shrug my shoulders and say “oh well… we missed the boat on that news!” But now I’m able to still get the news out about it! YAY! I’m just going to attach the email I got about the sale below. Looks like they’re going to have reps from all their big bridal jewelry lines there to answer any questions you might have. It’s a big investment (my husband reminds me of that regularly – haha!) so it’s good to get answers straight from the source! and diamond (minimum purchase $3000) offer good at the event only! Previous PostThis Week on Cincy Chic: Sporty ChicNext PostSara Benjamin’s Sale – Today Only!